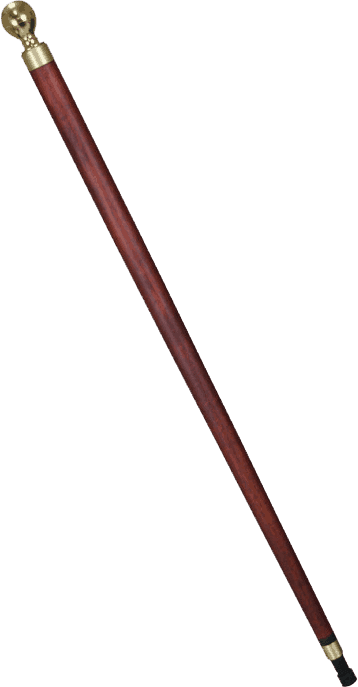 It’s simple, really - a pool cue cane is a walking stick with a pool cue on the end instead of a piece of ordinary wood. They’re popular amongst both pool and billiards players, and your options for a good one range from $20 all the way to $1,000+. This page will cover the different types of pool cue canes, how to make your own, and the best places to buy a professionally-made one (we know everyone isn’t into crafts). The first step is deciding how “pooly” you want your cane to be. You can get pool cue canes that don’t look like pool cues upon first glance. If someone is using a pool cue cane as his or her main walking stick, this is usually the right call - not everyone is looking to stand out as a billiards or pool player all of the time. If you’re getting it as a gift or for infrequent use, you can go a little wilder with it. Get one with crazy colors, and instead of a straight piece of wood up and down, get one with an actual pool ball attached to the end. If you have the money to spend, you can even start adding custom artwork or jewelry to your cue. 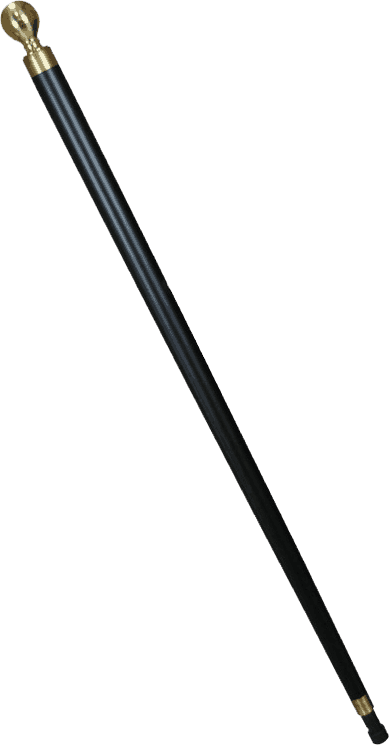 The most popular pool cue cane is made by a company called Gentlemen’s Emporium. As you can imagine, it’s more of a daily walker - the finish is a smooth, solid color of your choosing, and the cue elements are very subtle. Trained pool players will be able to recognize it instantly, but the general masses won’t. You’ll find mostly used items on eBay, but canes tend to last for a while. If you see a cane on here you like, make sure to check the pictures thoroughly and inquire into the condition - you don’t want to be buying junk. As long as you’re careful, you can find some really good deals on eBay. You can also get vintage canes on eBay - they cost more, but they look cooler. These can be much flashier than the one offered from Gentlemen’s Emporium. 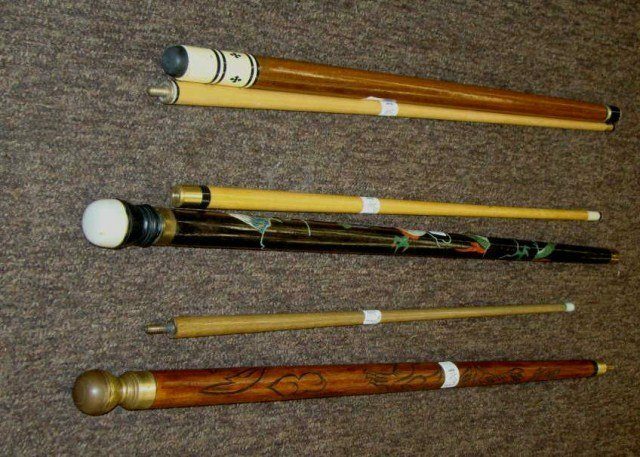 Almost everyone online sells just one or two different types of pool cue walking sticks. You can browse through all of them if you go to a site like Google, search for the term, and look through all of the retailers. In order to get onto Google Shopping, a retailer has to prove itself to be legitimate to Google, so you can feel safe from anyone listed on that page. Seeing as canes are quite popular with serious players, your local billiards shop is almost guaranteed to have a few in stock﻿ for you to take a look at. We would recommend calling beforehand to check, though some retailers post their inventory online, too. Another option is going to a pawn shop, though in general, these pool cue canes will be horribly overpriced or just horrible in the first place. No pawn shop owner is going to pay for a decent pool cue cane, so only go this route if you’re looking for a cheaper one for a gag gift or something of that nature. Unfortunately, making your own cue is quite difficult - you’ll have to buy a plain pool cue cane and customize it with exterior elements if you want to personalize it. All of the steps to making a cue are below - if you have all of the required machinery, more power to you! Hello, I’m Emily Clark, and I’m thrilled you’re here. I created this website to steer you in the right direction and help you save money, time and frustration that comes along with trying to find the right gear and accessories for playing cue sports. I’m on a constant journey to share my knowledge and experiences. If it’s out there, I’ve probably tried it. From ultimate guides to quick little tips & tricks, join me as I help you find the best options! I hope that my reviews and tips will help you make the right choice!